The Smithfield Club’s Christmas show of ‘fat cattle’ was held at the Baker Street Bazaar. The Bazaar exhibited a huge range of goods for sale that at various times included horses, carriages, stoves and ‘furnishing ironmongery.’ Samuel Godley worked here after the Napoleonic wars following his retirement from the 2nd Regiment of Life Guards of the The Household Cavalry. Bazaars were common throughout the 19th century, however the Baker Street Bazaar was particularly special as it was the first permanent home to Madame Tussauds London wax works and ‘Chamber of Horrors’! Having been apprenticed at just 6 years old, Madame Tussaud had a turbulent early life, becoming a tutor to Louis XVI’s sister, being forced by French revolutionaries to make death masks of the royal family, travelling Great Britain for 36 years before finally settling in Baker Street. After Madame Tussaud’s moved to its present home in Marylebone, the upper floor of the bazaar became function rooms known as the Portland Rooms. 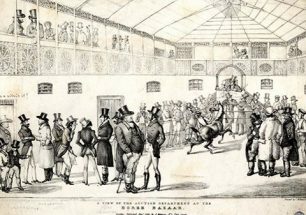 The Bazaar was also home to London’s first artificial ice rink. The Glaciarium opened in 1842. The ‘ice’ was made from churned-up hogs’ lard and sulphur. Reportedly, on hot days it smelled of cheese. In 1940, The Baker Street Bazaar, by then known as Druce’s burned almost to the ground. In 1941, two unexploded anti-aircraft missiles were removed from the ruins. By 1945 the site was deemed fit for demolition. Today the site is unrecognizable. In 1957 it was redeveloped as Michael House, the UK headquarters of Marks & Spencer until 2005. The site now forms part of the 55 Baker Street office complex.